Our next Seed Savers Albury-Wodonga gathering is Thursday August 6th from 6:30pm. Our guest speaker will be Dr Manu Saunders, post-doctoral research fellow on ecosystem services with the Institute for Land, Water and Society at Charles Sturt University. 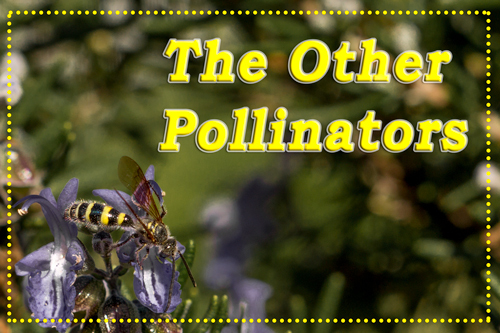 Dr Saunders will share with us her research and reflections in a talk about “The Other Pollinators: what they do for you & how you can return the favour”. Dr Saunders will offer insights into the roles of all sorts of pollinators in food growing and agriculture. Noting that European honey bees aren’t the only pollinators, she’ll look which other insects are involved and how you might help to provide a welcoming environment in your garden to encourage them. Dr Saunders created the Wild Pollinator Count, a project that aims to help increase the awareness of, and information about, all sorts of pollinators in Australia and that anyone can participate in. We hope you will join us for this informative talk. Also: Our seed bank will be available for members on this evening. If you are able to bring a plate of something to share that would be lovely, but is by no means a necessity. Gold coin donation requested from non-members. Our annual general meeting (AGM) will also be held on this evening, per our requirements as an incorporated association. We’ll give you plenty of opportunity to leave after the talk if attending the AGM is not of interest to you. This entry was posted in Upcoming events and tagged biodiversity, food growing, pollinators by Seed Savers Albury-Wodonga. Bookmark the permalink.